For the sixth year in a row, Adviser Investments has been recognized on Barron’s list of “Top 100 Independent Wealth Advisors .” Our Top-30 ranking (which appeared in the September 14, 2018 issue) is based on the quality of our practice, as well as our size and financial health as determined by Barron’s editors. It’s gratifying for our team to see our hard work spotlighted like this and a credit to the consistent quality of service we strive to provide to every client. But we wouldn’t be in the national lens without our clients’ trust and business. The lasting relationships we have built with them are far more rewarding than media mentions. Here’s to our continued mutual success! You can listen to all of our podcasts on our dedicated The Adviser You Can Talk To website as well as on other popular podcast and streaming sites (Apple Podcasts, Google Play, iHeartRadio and Spotify among them). Enjoy them at your convenience and subscribe for instant access to new episodes as soon as they become available. We hope you find them entertaining and informative, and would welcome your feedback and ideas for future episodes. There’s a new game in town for conscience-driven investors. On Thursday, September 20, Vanguard launched its ESG U.S. Stock ETF and ESG International Stock ETF. We took a deep dive into Vanguard’s history of “socially responsible” investment (SRI) products when the firm announced plans to bring these new ETFs to market. We also explored some of the potential drawbacks that ESG investors should consider before putting their money into these kinds of funds. Vanguard’s been offering an SRI option to its shareholders since the inception of its FTSE Social Index fund in May 2000. While the results haven’t been particularly compelling, the firm is reading the writing on the wall and is doubling down, as ESG (environmental, governance, social) investing has become increasingly popular worldwide. According to Vanguard, global ESG assets under management rose from $13.3 trillion in 2012 to $22.9 trillion in 2016, a 73% increase. At their launch, Vanguard ESG U.S. Stock ETF (Ticker: ESGV) and Vanguard ESG International Stock ETF (VSGX) had expense ratios of 0.12% and 0.15%, respectively. Vanguard will use an index sampling approach (which means they will own a representative subset of stocks instead of replicating the entire index) for the ETFs’ portfolios based upon their FTSE U.S. All Cap Choice Index (ESGV) and FTSE Global All Cap ex.-U.S. Choice Index (VSGX) benchmarks. These indexes include companies of all sizes, but exclude companies in the adult entertainment, alcohol, tobacco, weapons, fossil fuels, gambling and nuclear power industries. The remaining companies are screened using the U.N. Global Compact Principles and must have at least one woman on their boards of directors. Other diversity and equal opportunity screens are also employed. Even after all of these filters, the indexes hold 1,551 stocks (U.S. All Cap Choice Index) and 4,449 stocks (Global All Cap ex.-U.S. Choice Index) each. We’d caution that investors in ESG or SRI funds—whether offered by Vanguard or not—need to understand that returns may be impacted by limiting your investment choices with screens that don’t necessarily take financial standing, future earnings or other traditional factors into account. And one investor’s ESG company may not be another’s. The criteria for inclusion (or exclusion) in funds like this can be highly subjective. Still, if the knowledge that you own an ESG fund or strategy will help you feel good about how your money is invested (and make it more likely that you’ll stay invested for the long-term), the tradeoffs could be worth the benefits. For those who are interested in ESG investing, we recommend they carefully consider their options and employ a disciplined, diversified approach when building their portfolio. The good news is that, with these two new ETFs from Vanguard and those launched from other providers, there are many more options today than there were just a few years ago. That said, as within the greater universe of funds out there, quality and performance can vary greatly in the ESG space. Is Fidelity taking a hard look at its actively managed target-date funds? Lodged in an announcement about the closure of a fund that was only available as a component of other Fidelity funds was a hint that they may be doing just that. In an uncommon move for the Boston fund giant, last week we learned that Fidelity has been winding down its Series 100 Index fund, which was a $3.7 billion dollar mega-cap index fund as of January 31. Why close down a relatively substantial fund? Too much portfolio overlap with the other funds held by its target-date funds. As a refresher, target-date, or “lifecycle,” funds usually own baskets of other mutual funds (in Schwab’s case, the underlying investments are ETFs), and the fund name will include a year that corresponds with the shareholder’s planned (or actual) retirement date. The funds periodically rebalance along a “glide path,” slowly shifting allocations from stocks to bonds as the date nears. Once the date passes, the glide path generally continues to slide down to a bond-heavy portfolio focused on preserving assets and providing income. In recent months, Fidelity had been gradually selling off assets of the Fidelity Series 100 Index fund, and it is no longer listed on Fidelity’s platform. As mentioned above, this internal-only fund appeared solely as a holding of other Fidelity fund portfolios and was not available to direct investments from individuals. Fidelity seems to be acknowledging one of our criticisms of Fidelity’s Freedom target-date funds (funds composed of other actively managed and index funds). There are just too many funds and managers delivered in an “active” wrapper, and too many of the funds own the same stocks. Take, for example, the Fidelity Freedom 2060 fund, which owns 29 other Fidelity funds in a 90/10 stock/bond allocation, including nine different funds with shares of tech titan Apple Inc. One of them is Series 100 Index, which had 6.1% of its assets in Apple as of July 31. “The management team felt that the combination of other series funds would achieve the desired portfolio characteristics, and have been reducing exposure to Series 100 Index,” Fidelity spokesman Adam Banker told Reuters earlier this month. Fidelity’s been tinkering with its target-date-fund strategy in search of the right mix of active and passive investing as more and more investors are paying attention to costs. In July, we looked at Fidelity’s move to blend its target-date funds that use active managers with those in its product suite that take an index-fund-only approach. Our view on target-date funds has remained consistent even as they’ve grown in popularity. Yes, a quick and easy single-fund solution could hold appeal for less sophisticated investors. And any saving and investing for retirement is good saving and investing for retirement. But while target-date funds make for a good first step, people with more at stake have better options out there. Simply put, one-size-fits-all doesn’t work in investing. Rather, a diversified portfolio of select actively managed funds—with managers who complement each other rather than overlapping and canceling out their best ideas—customized to individuals’ personal needs and goals is our preferred approach. Please contact us at (800) 492-6868 or info@adviserinvestments.com if you’d like to discover what Adviser Investments can do for you! Adviser Investments operates as an independent, professional wealth management firm with expertise in Fidelity and Vanguard funds, actively managed mutual funds, ETFs, fixed-income investing, tactical strategies and financial planning. Our investment professionals focus on helping individual investors, trusts, foundations and institutions meet their investment goals. Our minimum account size is $350,000. 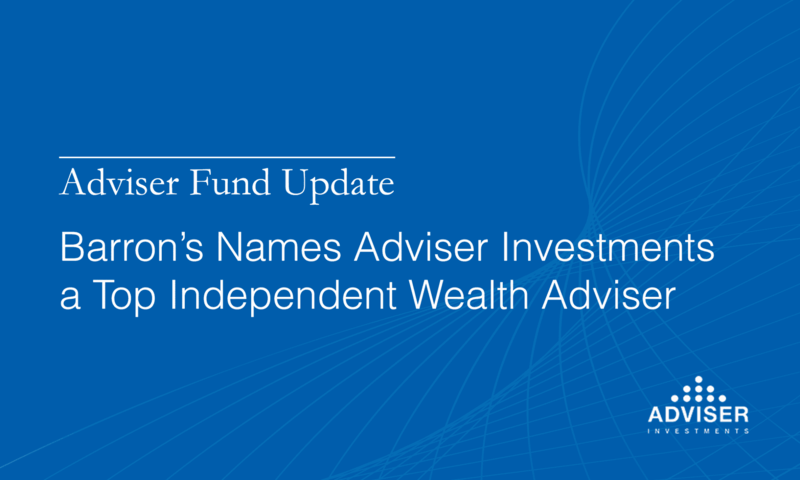 For the sixth consecutive year, Adviser Investments was named to Barron’s list of the top 100 independent financial advisers nationwide and its list of the top advisory firms in Massachusetts in 2017 and 2018. We have also been recognized on the Financial Times 300 Top Registered Investment Advisers list in 2014, 2015, 2016 and 2018. Please note: This update was prepared on Friday, September 21, 2018, prior to the market’s close.